Big Nate is a New York Times bestselling series (82 weeks and counting!) with almost 5 million books in print! This second comic-strip compilation offers up lots of laughs! With 200 all-new Big Nate strips, plus BRAND-NEW Big Nate activities! Cheez Doodle fanatic. Master of pulling pranks. Cartooning expert. Big Nate knows fun. He is the king of detention, after all. He may not be Joe Honor Roll, but Nate knows he’s meant for big things—REALLY big things. Now Nate’s funnier than ever in the second of four BRAND-NEW HarperCollins Big Nate comic-book compilations! Featuring 200 strips from June 2008 through January 2009 and bonus activities. Plus a sneak peek at Big Nate: In the Zone, the sixth Big Nate book! And there’s big-time buzz—Big Nate: In a Class by Himself was selected for the Horn Book Fanfare List of Best Books of 2010 and BarnesandNoble.com’s Top 10; Big Nate Strikes Again was selected as a Chicago Best Book, a Junior Library Guild pick, and a Children’s Book of the Month Club Pick; and Big Nate on a Roll received a starred review from Kirkus Reviews. Also, the Big Nate series has been licensed in twenty-five foreign deals so far. 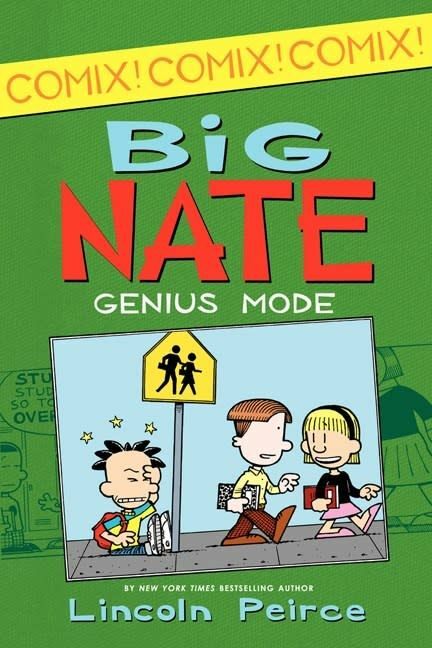 All four Big Nate novels and comic compilations are also available as ebooks in the iTunes bookstore and the Nook bookstore and for the Kindle Fire, and the Big Nate: Comix by U! app released in December 2011! You too can be a cartoonist just like Nate, with help from Lincoln Peirce!